Billionaire George Soros is back in Kiev to discuss the country’s economic reconstruction. Soros met top government officials to talk about fighting corruption as Ukraine faces an acute economic crisis, and could be on the verge of a debt default. Soros held a meeting with Ukraine Parliament members Monday to talk about the effectiveness of the fight against corruption and other issues. The financier and philanthropist is reportedly staying at a five-star hotel in the capital, but many details of the visit have been kept confidential. At the meeting with Soros the parliament members discussed the idea of creating a foreign direct investment fund in Ukraine to prop up the country’s ailing economy. The group also discussed who will be the chair of the Anti-Corruption Bureau. "Next week will be busy with the visits of foreign guests, including Mr. Soros, who always has original thoughts on the role and mission of Ukraine,” the chair of Ukraine’s parliamentary committee on foreign affairs Anna Gopko wrote on her Facebook page ahead of Soros’ arrival on Monday. PACE President Anne Brasseur will also be present at the talks. George Soros published an article in the New York Review of Books on January 7th, calling on Europe and the West to put together a $50 billion rescue package for the “new” Ukraine, upping his October suggestion of $20 billion. The $50 billion package, dubbed the Ukraine ‘Marshall Plan’, suggests taking money from unused rescue funds for other EU countries and from the IMF, the European Investment Bank, the World Bank and the European Bank for Reconstruction and Development, as well as other sources. The US helped financially to rebuild Europe after World War II with the original Marshall Plan. The new so-called ‘Marshall Plan’ focuses on supporting Ukraine, and not weakening Russia as the two economies are closely tied. It’s far more important to focus on how to support and strengthen Ukraine than how to weaken and sanction Russia. The new government in Kiev has already secured a $17 billion aid package from the International Monetary Fund, but only the first two tranches totaling $4.6 billion has been sent, since the government has been slow to enact economic and political reforms, as well as set a budget. The IMF, which resumes work in Kiev this week, previously said Ukraine may require an additional $15 billion in aid. Germany has been reluctant to sink money into the Ukraine cause. To date, Europe’s largest economy has only guaranteed a €500 million loan, which is to be used to rebuild the war-torn Eastern regions, not to pay off the country’s massive debt. The European Commission has put forward a €1.8 billion loan, but still awaits approval from the European Parliament. 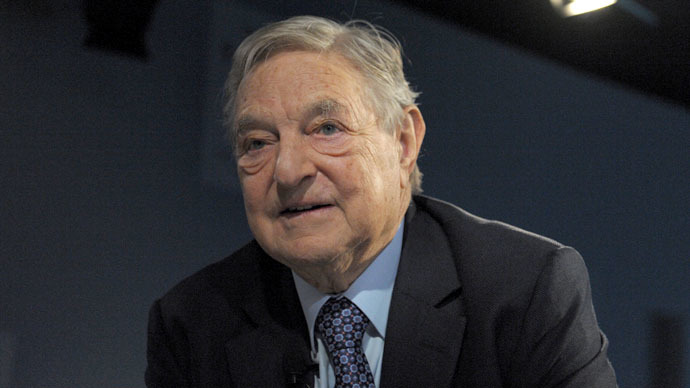 Soros, born György Schwartz in Hungary, fled in the 1940s for the UK and later became an American citizen. The finance guru has been involved in Ukrainian affairs since 1989. Two years before the fall of the Soviet Union and Ukraine’s first independent election, Soros founded the Ukrainian International Renaissance Foundation (IRF), which has provided more than $100 million to Ukrainian NGOs. Several non-governmental organizations in Ukraine that aided the EuroMaidan movement that helped toppled the Yanukovich government last February and that advocate closer ties to the EU are tied to Soros. Soros is the 30th richest person in the world, according to Forbes’ ranking, and had a personal fortune of $19 billion as of March 2013.